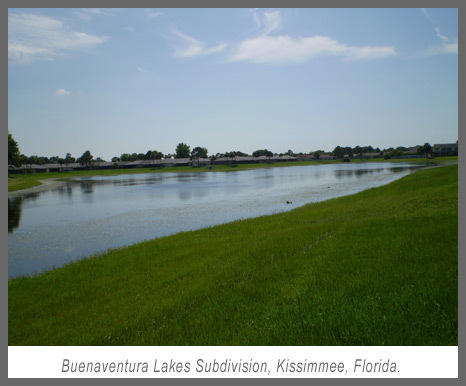 In June of 2010, I relocated from East Harlem, New York to Kissimmee, Florida to begin my ethnographic fieldwork in the Buenaventura Lakes (BVL) Subdivision. BVL is situated in the Orlando-Kissimmee Metropolitan Area, located within a 20-mile radius of several international tourist destinations, most notably Disney World. According to the 2006-2008 American Community Survey, BVL has a total population of 25,343. At the time of the survey there were 10,514 Puerto Ricans, 615 Cubans, 210 Mexicans, and 5,278 individuals that identified as “other Hispanic or Latino.” Buenaventura Lakes was incorrectly labeled as Yeehaw Junction in the 2000 Census and the 2006-2008 American Community Survey. Given the large number of Puerto Ricans, I was surprised to observe the following street names within the vicinity of my home: Mexicali Way, Oaxaca Lane, Toluca Drive, Guadalajara Drive, Merida Drive, Campeche Lane, Vera Cruz Avenue, and Acapulco Drive. These street names are derived from place-names in Mexico. I later learned about the Mexican millionaires who were responsible for the BVL project. In the 1970s there was growing fear that Mexico would nationalize, therefore Mexican land developers decided to invest in the United States. Their initial intention was to sell plots of land, but they transitioned to home sales after swampland scandals affected Florida land sales operations. The land developers initially created the Real Estate Corporation of Florida to sell plots of land, but they later created the Landstar Homes Corporation when they went into home sales. In 1978, Landstar Homes constructed their first home in rural Osceola County. Long-time residents mentioned that BVL was all farmland back then and described the cows and ducks that would obstruct the area’s one road, Boggy Creek. Landstar opened sales offices in New York, Chicago, and New Jersey offering “Affordable Luxury” and “Country Club Living.” Sales offices were also opened in Mexico, Venezuela, and Puerto Rico, which contributed to the influx of Puerto Ricans in the 1980s. Fast forward to 2010, where the Puerto Rican and Hispanic presence demands attention. Numerous supermarkets (Publix Sabor, Bravo, El Aguila) restaurants (Pioco’s Chicken, La Carreta, Delicias, Sebastian Café, Churro Mania, Tropico, La Caribeña) and other small businesses cater to the Hispanic residents of BVL, and dominate the commercial landscape. Upon first glance, it is not always obvious that the residential spaces of this suburban subdivision house such a large concentration of Puerto Ricans. However, a Puerto Rican flag hanging in a garage, window, or as an insignia on a car serves as a reminder. At the same time, I have observed space being used differently than what I have been accustomed to in other suburbs where I have lived or visited. In suburban developments, social life often occurs within the house or in the rear of the home, within private backyards that are equipped with pools and grills. 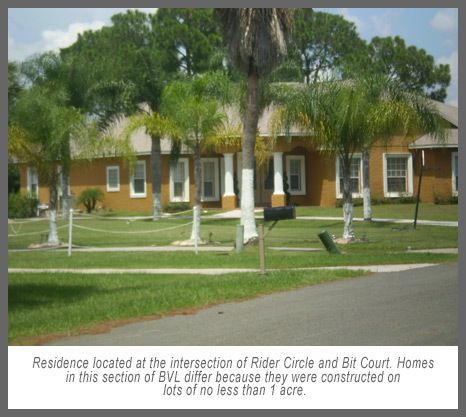 In BVL it is not uncommon to observe residents sitting on lawn chairs in front of their homes, socializing in garages that have been converted to common areas with tables, chairs, and couches, or performing mechanical work in their driveways and garages. The weekends bring a plethora of garage sales, yard sales, and the occasional poster board advertising alcapurrias (meat fritters) or pinchos (shish kebab) available from a grill that has been set up on the front lawn or in a garage. These practices, the concentration of Puerto Ricans, the presence of Hispanic and Puerto Rican businesses, and the absence of a regulatory Home Owners Association have earned BVL the nickname Boricuas Viven Libre. Still, the community faces a number of challenges. Residents have mentioned the need for increased code enforcement, infrastructural improvements, beautification projects, the debate over incorporation, and the lack of social spaces and social activities. The closure of both BVL golf courses, and the country club was a disappointment to the residents who bought into the country club lifestyle. While there is a great deal of “crime talk” about drugs, gangs, and graffiti, the mortgage crisis is what I find most visible. It is hard to go down a street without passing a “For Sale” sign or a vacant property (oftentimes a foreclosure) that has been neglected. Since 2008, Florida has ranked amongst the top states in the country for foreclosure filings. In 2009, the Orlando Sentinel reported that a majority of foreclosed homes in Central Florida were located in two predominately Puerto Rican communities, one of which was BVL. During the next two years I will be investigating Puerto Rican migration to Osceola County, social class formation, the homeownership experience, and the effects of the mortgage crisis. Social class can be an ambiguous, fluid, and complex category when used to describe populations that have been traditionally homogenized as “underclassed” and racialized as non-white, as has been the case of Puerto Ricans. My research will address the fragility and ambiguity of social class identities by examining how Puerto Ricans articulate, perform, and protect their class identities, particularly in light of an economic crisis in both Puerto Rico and the U.S. mainland. © Simone Delerme. Published by permission in Centro Voices on 17 September 2014. [Originally published by Voices in 2010].